Congrats to this month winner,JDizzlle ! vote here for GUN OF THE MONTH or to enter your AEG into the contest. prize will be given to 1st place AEG. hostage-rescue mission carried out by the Israel Defense Forces (IDF) at Entebbe Airport in Uganda on July 4, 1976. A week earlier, on June 27, an Air France plane with 300 passengers was hijacked by Palestinian terrorists and flown to Entebbe, near Kampala, the capital of Uganda. Shortly after landing, all non-Jewish passengers were released. The IDF acted on intelligence provided by Israeli secret agency Mossad. In the wake of the hijacking by members of the militant organizations Revolutionary Cells and the Popular Front for the Liberation of Palestine, along with the hijackers' threats to kill the hostages if their prisoner release demands were not met, the rescue operation was planned. These plans included preparation for armed resistance from Ugandan military troops. The operation took place under cover of darkness, as Israeli transport planes carried 100 elite commandos over 2,500 miles (4,000 km) to Uganda for the rescue operation. The operation, which took a week of planning, lasted 90 minutes and 103 hostages were rescued. Five Israeli commandos were wounded and one, commander Netanyahu, was killed. All the hijackers, three hostages and 45 Ugandan soldiers were killed, and 11 Russian-built MiG fighters of Uganda's air force were destroyed. A fourth hostage was murdered  by Ugandan army officers at a nearby hospital. The successful rescue, named Operation Thunderbolt,[note 1] is sometimes referred to as Operation Jonathan in memory of the unit's leader, Jonathan Netanyahu. He was the older brother of Benjamin Netanyahu, currently the Prime Minister of Israel. 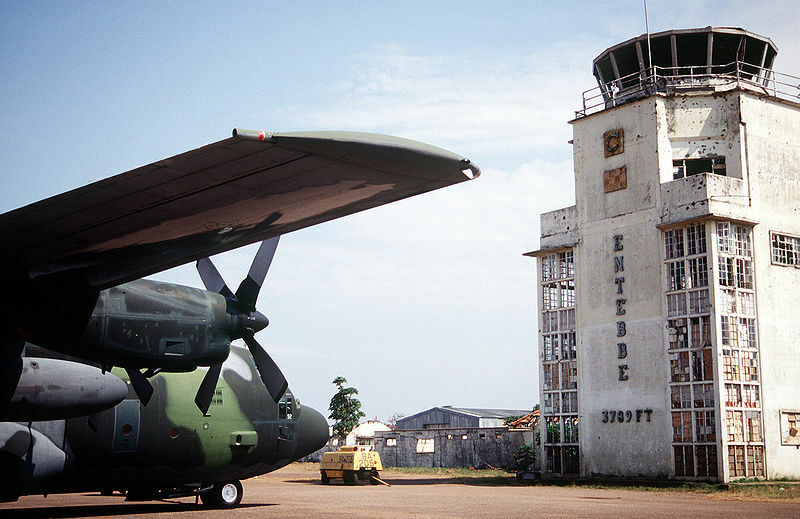 As a direct result of the successful operation, the United States military developed highly-trained rescue teams modeled on the Entebbe rescue. Its most visible, although unsuccessful effort, was the attempted rescue of 53 American embassy personnel held hostage in Tehran, during the Iran hostage crisis. On the 1 July deadline, the Israeli government offered to negotiate with the hijackers in order to extend the deadline to 4 July. Amin asked them to extend the deadline until 4 July. This meant he could take a diplomatic trip to Port Louis, Mauritius, in order to officially hand over the chairmanship of the Organisation of African Unity to Seewoosagur Ramgoolam. This extension of the hostage deadline would prove crucial in allowing Israeli forces enough time to get to Entebbe. On 3 July, the Israeli cabinet approved the rescue mission, under the command of Major General Yekutiel "Kuti" Adam with Matan Vilnai as the Deputy Commander. Brigadier General Dan Shomron was appointed to command the operation on the ground. While preparing the raid israel army consult with some israel firms because israeli firms were often involved in building projects in Africa during the 1960s and 1970s. One reason the raid was so well-planned was that the building in which the hostages were being held was built by an Israeli construction firm, who still had the blueprints, and supplied them to the government of Israel. Additionally, Mossad (Israel's intelligence service) built an accurate picture of the whereabouts of the hostages, the number of militants and the involvement of Ugandan troops from the released hostages in Paris. While planning the military operation, the Israeli army built a partial replica of the airport terminal with the help of some Israeli civilians who had helped build it. It has been claimed by researchers that after arriving at the military base to begin work on the replica building (not being aware beforehand what they were to do), the civilian Israeli contractors were invited to dinner with the commander of the base. At the dinner, it was indicated to them that, upon completion of the replica, and in the best interest of national security, they would be held as guests of the military for a few days. During the entire operation an extremely high level of secrecy was maintained. 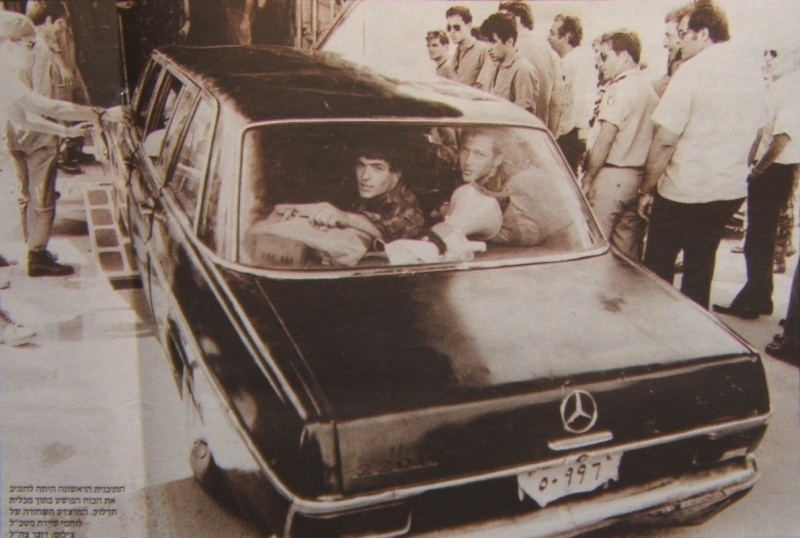 According to a July 5, 2006, Associated Press interview with raid organizer "Muki" Betser, Mossad operatives extensively interviewed the hostages who had been released. As a result, another source of information was a French-Jewish passenger who had been mistakenly released with the non-Jewish hostages. Betzer reports that the man had military training and "a phenomenal memory", allowing him to give information about the number and arms of the hostage-takers, among other useful details. 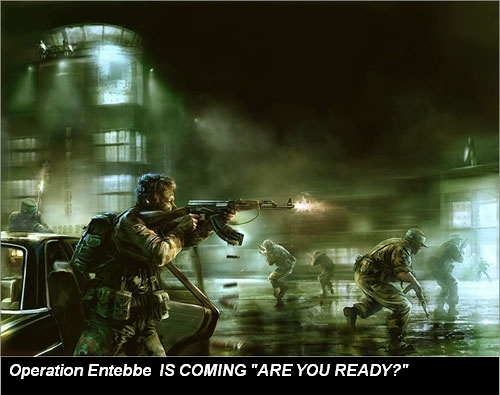 After days of collecting intelligence and planning by Netanyahu's deputy Moshe "Muki" Betser, four Israeli Air Force C-130 Hercules transport aircraft flew secretly to Entebbe Airport, by cover of night, without aid of Entebbe ground control. Their route was over Sharm al-Sheikh, and down the international flight path over the Red Sea, flying at a height of no more than 30 m (100 feet) to avoid radar detection by Egyptian, Sudanese, and Saudi Arabian forces. Near the south outlet of the Red Sea the C-130s turned south and passed south of Djibouti. From there they went to a point northeast of Nairobi, Kenya—likely across Somalia and the Ogaden area of Ethiopia. They then turned west, passing through the African Rift Valley and over Lake Victoria. They were followed by two Boeing 707 jets. The first Boeing contained medical facilities and landed at Jomo Kenyatta International Airport in Nairobi, Kenya. 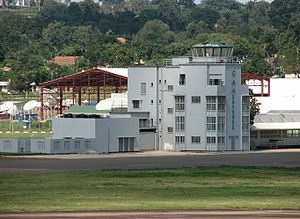 The commander of the operation, General Yekutiel Adam, was on board the second Boeing, which circled over Entebbe Airport during the raid. This small group comprised the overall ground commander, Brig. Gen. Shomron, and the communications and support personnel. 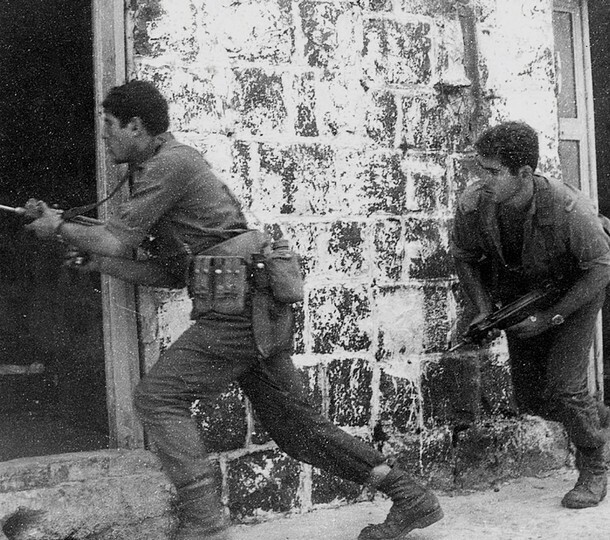 A 29-man assault unit led by Lt. Col. Netanyahu, this force was composed entirely of commandos from Sayeret Matkal, and was given the primary task of assaulting the old terminal and rescuing the hostages. 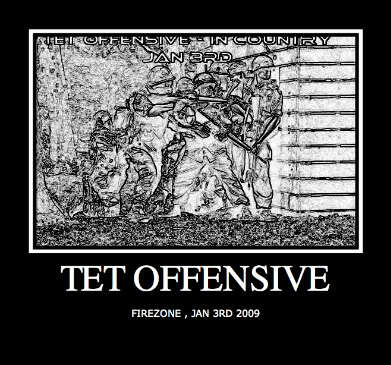 Major Betser led one of the element's assault teams; Matan Vilnai led another. 1.Securing the area, and preventing any hostile ground forces from interfering with the C-130 Hercules aircraft and the actual rescue. 2.Destroying the squadron of MiG fighter jets on the ground, to prevent any possible interceptions by the Ugandan Air Force. 3.Providing protection for and assisting in the loading of the hostages aboard the transports. The aircraft was carrying 248 passengers and 12 crew members[note 2]—of which four passengers were killed and ten injured. From the total of 260 people on board, 256 returned home safely. A fourth hostage was later killed by Ugandan army officers at the Mulago Hospital in Kampala. 1.Jean-Jacques Maimoni—a 19-year-old French Jew who stood up while the Israeli commandos were eliminating the hijackers. They mistook him for a hijacker. 2.Pasco Cohen—a 52-year-old manager of an Israeli medical insurance fund, who was fatally wounded by gunfire, either from the hijackers or accidentally by the Israeli commandos. 3.Ida Borochovitch—a 56-year-old Russian Jew who had emigrated to Israel, also killed in the crossfire. 4.Dora Bloch—a 75-year-old murdered by the Ugandan government at Mulago Hospital in Kampala while receiving treatment for a condition unrelated to the raid. Her remains were recovered near a sugar plantation 20 miles (32 km) east of Kampala in 1979. According to a list by Air France, most of the passengers were Israeli, French, American, and British citizens. All of the 105 hostages taken were Jews. 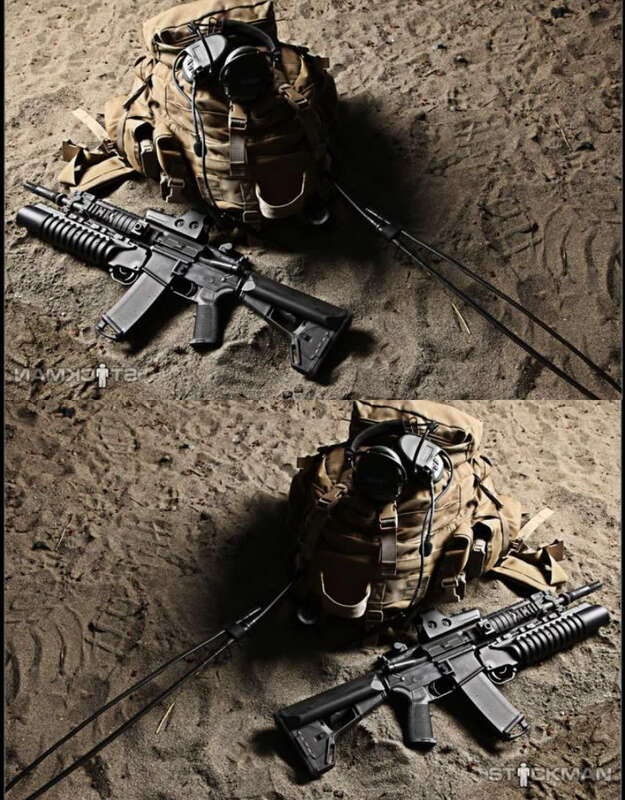 For this game addition to players at least 10 Hostages need it. 10% of the all players. Yonatan Netanyahu Will be the key person along with the Hostages. I think This will be a good game as long as played at night time. another anacdote, Idi amin was a known cannibal. also, notice the guys with the caps, they got BLUE TAPE for recognition (just like we do in our airsfot) so there wont be force casualty. the famous black mercedes used to neuturalize the guards with silencers on the tarmac approach, yoni inside.